'We're going back'. 'Back where?' Back to the journey, man. Join Dmitri Yshkvin as he attempts the Pentagon challenge. So here I am with a challenge I have attempted a number of times only to give up part way through, but not this time! Welcome to my Pentagon Challenge! All being well this is going to be my only ongoing save and this is definitely something I am going all in with. 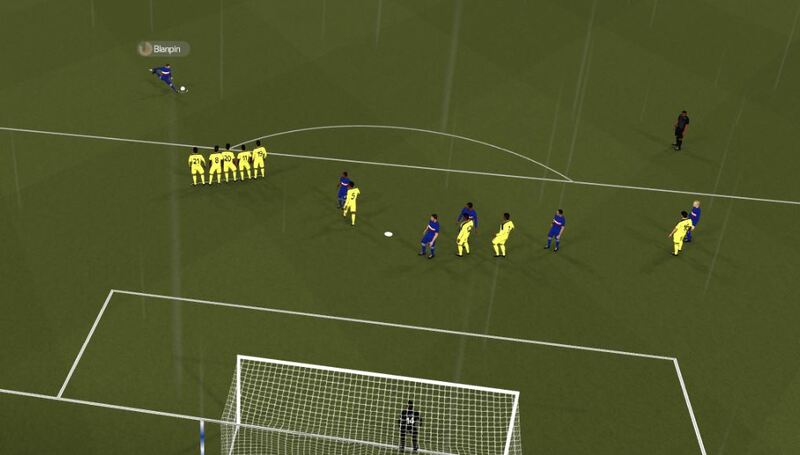 I have seen on another forum some guy had completed this ‘challenge’ in 9 seasons, NINE! He was boasting at how easy it was yet the team he started off at was Guanzaou Evergrande (Chinas biggest team) before going to Kaiser Chiefs (South Africa’s biggest team) then Santos in Mexico, Boca Juniors and finishing it off at Dortmund. Now winning all 5 is an achievement but come on, those are some of the biggest clubs in their respective continents and winning the Champions League is expected from each of those teams. I am sticking to the traditional method of starting a challenge of unemployed and seeing where it takes me. 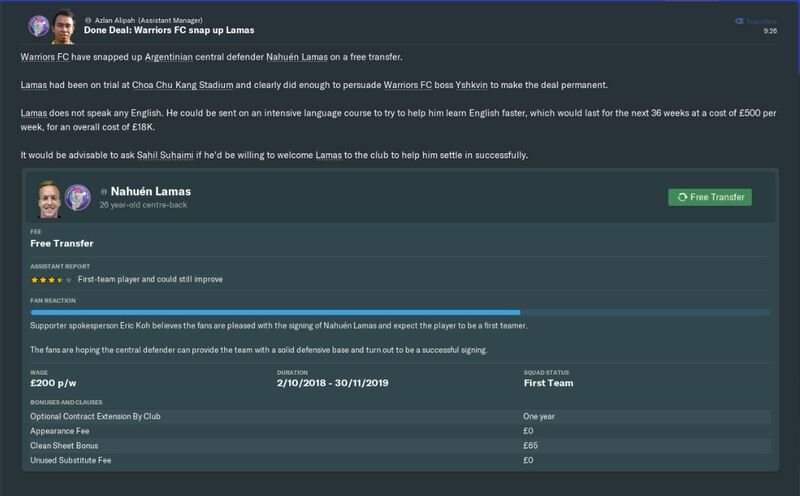 On other forums I’ve seen people leave as soon as they win the Champions League in that continent, however I will only leave if there is a decent opportunity to do so, I won’t just leave if / when I win a Champions League. 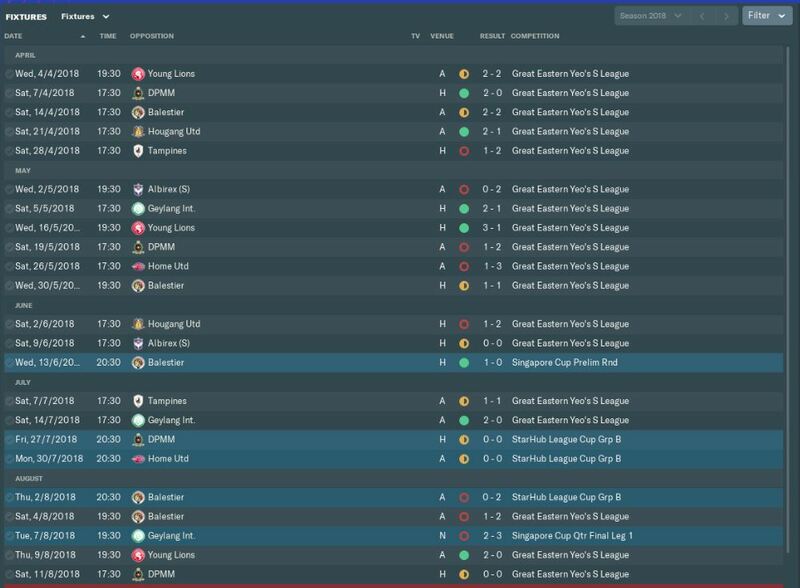 If you’ve seen any of my other threads you’ll know I like my saves to be as realistic as possible, and with that in mind I have Malaysia and Singapore loaded from the start as these nations rep is low enough to start the game at a realistic level whilst being able to build up my own rep to move on. 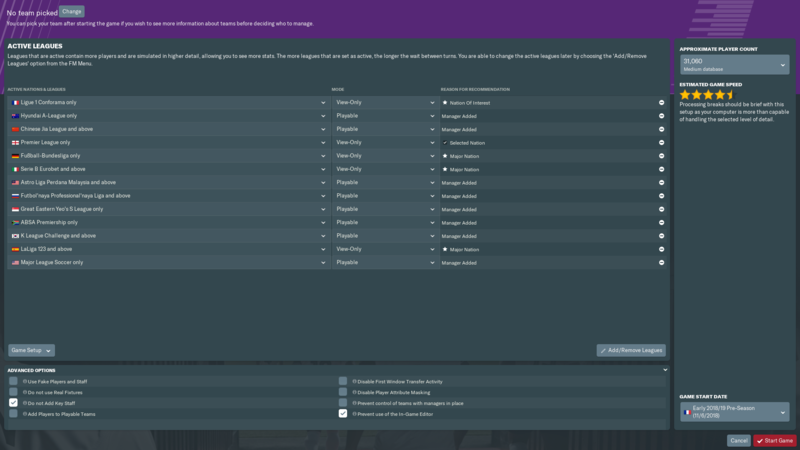 As I like realism I will try to keep the career going at a realistic pace, I've seen others do it on the forums rejecting jobs that wouldn't happen in real life, an example I saw on another thread a guy was offered a job in France after only managing in Andorra for 3 seasons so he rejected it. I'll try and keep it as realistic as I can. The start of the journey then, and we’re following Russian football manager Dmitri Yshkvin (thanks Russian name generator) as he sets out from his home city of Kazan in the Southwest of Russia to embark on a worldwide journey in the hopes of conquering each continent. My first destination on the journey is the great country of Singapore, in the city of Jurong East. A decent sized club in this country and a good starting point for my aim of conquering each continent. This isn’t a make or break job, the expectation is to be competitive. The club hasn’t done too badly really and find themselves 5th in the league. On my first day in the job, apparent star striker Jonathan Behe moans about wanting to leave. I try to convince him but ultimately he’s not up for the fight. Transfer list and dropped to the reserves for you, I've got a mission to complete and I’ve got no time for hangers on. 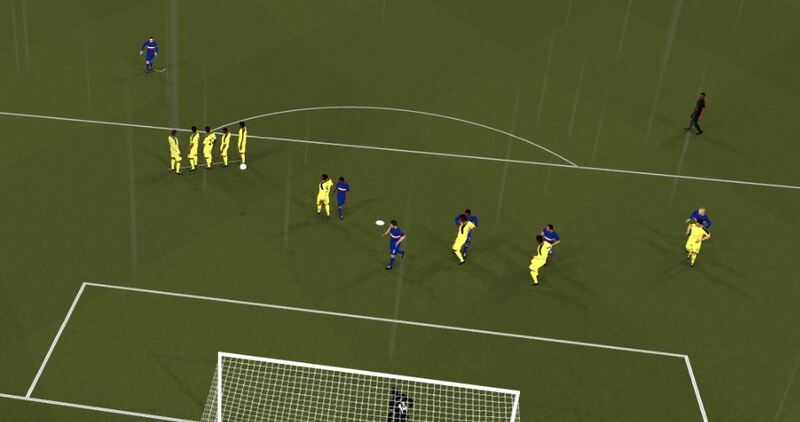 I’m going to be setting this team up with a traditional 442 formation. It works the world over, is very easy to train and most players can fit into this set up. 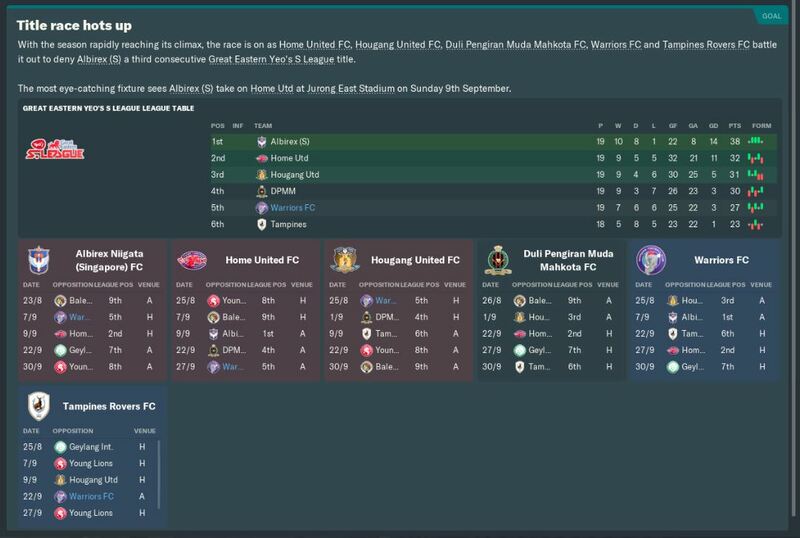 Our first game is against Home United in the league. A win here would do wonders for me but more importantly the team as we need to get some good form going. 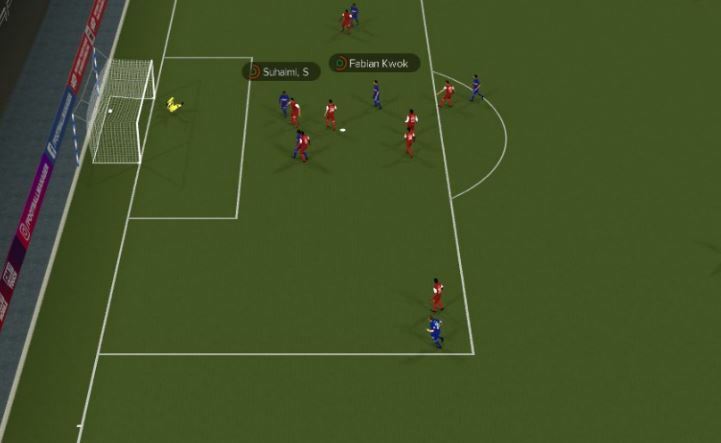 Only as far as Kasman on the edge of the box…. Who hits a sweet volley that 2 keepers wouldn’t have saved. 1-0!! Other than that we saw out an even game. A great goal to give me a great start. After this it’s brought up in the press that despite this teams lack of good form, whilst unlikely we can still win the title. 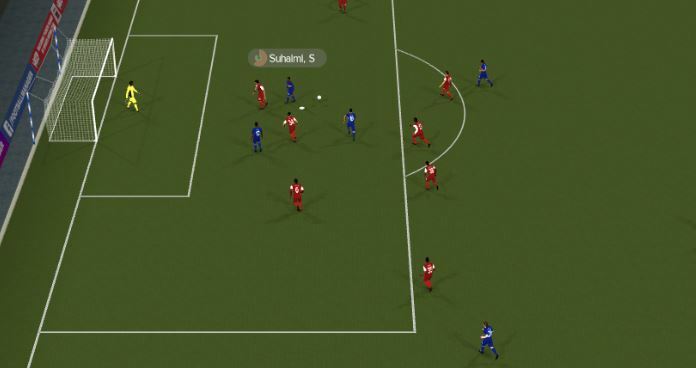 Our final game of the month sees us in a second leg cup tie against Geylang who hold a 3-2 aggregate lead. 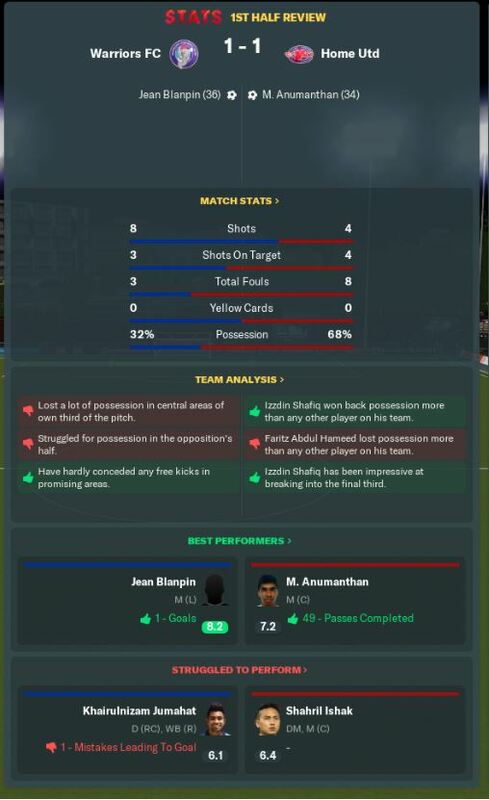 Despite winning this leg the away goals rule knocked us out. Oh well maybe next year. 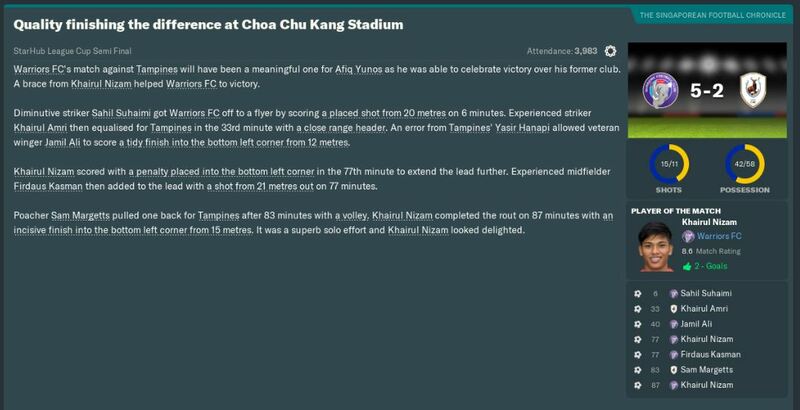 We then had Tampines at home and dominated the game with a 2-0 win. Another good performance to keep us going right until the end. 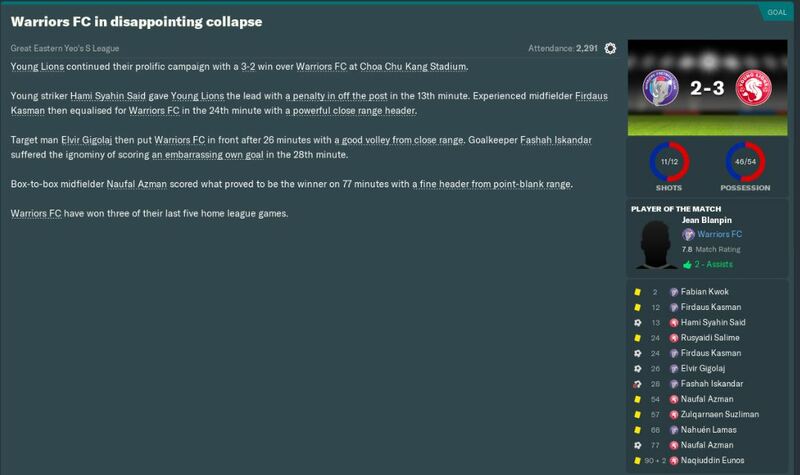 The final game of the season sees us lose 2-1 at home to Geylang, my first loss at this team. That’s it for this update. 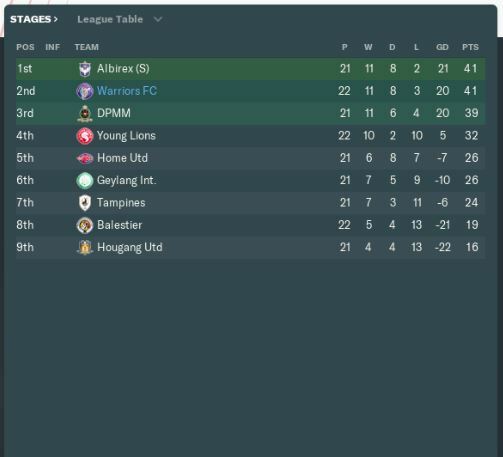 We finished a respectable 3rd in the league and qualifying for the Champions League. I know 100% we won’t win that, we might not even get to the groups but I’ll give it a good go. My journey to conquer the world starts here in Asia and I’ve enjoyed so far. 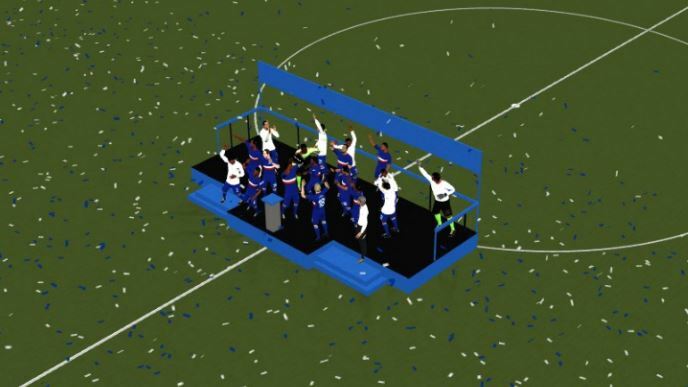 Next update will be pre season stuff and the first round of games next season. End of season review and we lived up to our pre season odds of third and a continental place. 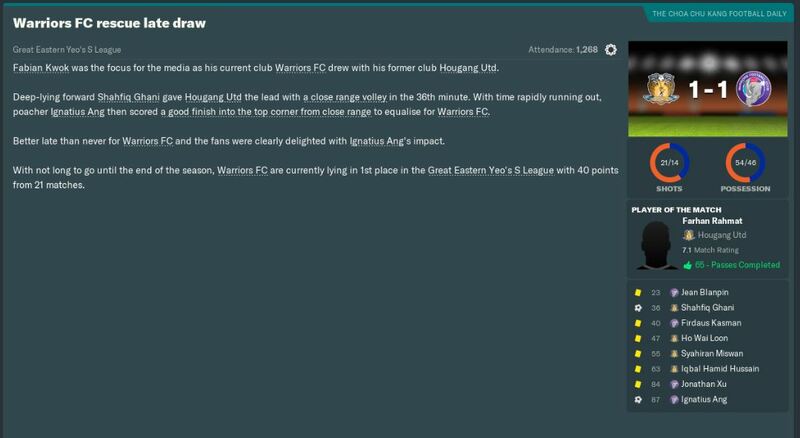 Fixture list announced and first game of my first full season in charge is against Hougang. 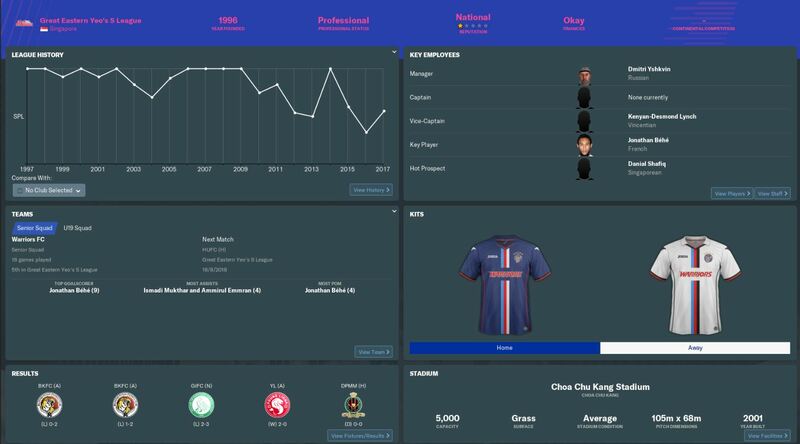 Last signing before the season kicks off and we made a swap deal with Hougang which sees back up at best center forward Suria Prakash going there and we got center midfielder Fabian Kwok. But he manages to carry the ball over the line, 1-0!! Deep in the first half new boy Lamas gets himself sent off and from there we’re under the cosh from then on. We do however hold on and win the game 1-0! Scenes, absolute scenes! We’re drawn in the next preliminary round against Thai opposition Muangthong. We have to be confident of getting something from this game but we’ll see. 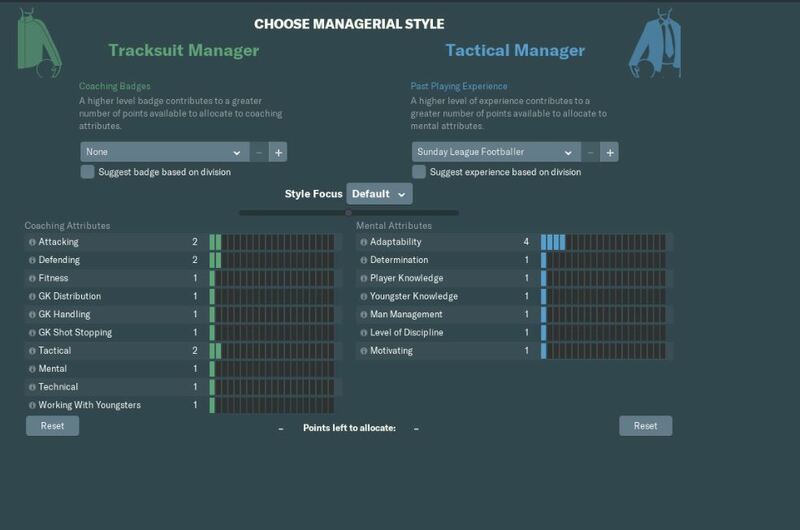 Last point on this update is I’ve started a coaching course which will hopefully help get more jobs later in the save. Thanks for reading, next update (should be today) will be the next round of Champions League and first set of league games. 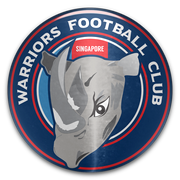 2018 - 19 | Warriors FC (Singapore) -- Took over with 6 games left, finished 3rd in S League, qualified for the Asian Champions League. 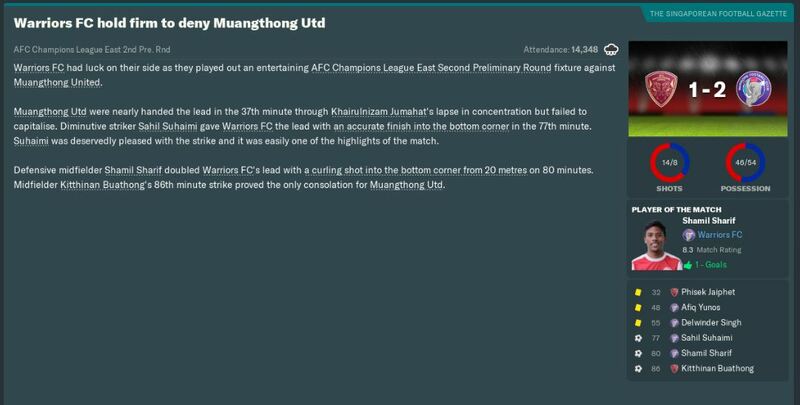 We kick off this update with a win in our Champions League preliminary round against Muangthong of the Philippines. We rode our luck a little bit as we went 2 up before letting them score, but we’re through to the next round. We’re drawn against Japanese opposition in the from of Kashima Antlers in the next round, and a very tough test. 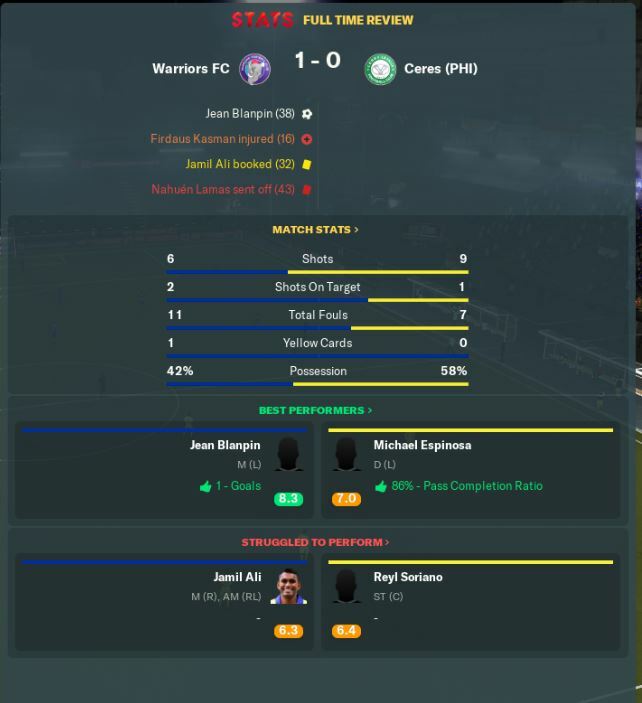 We went down 2-1 in Japan to end our Champions League run. I’m not too disheartened at this as we’ve done well to get this far. Pre season odds of a 5th place finish and we’re looking to beat that really. 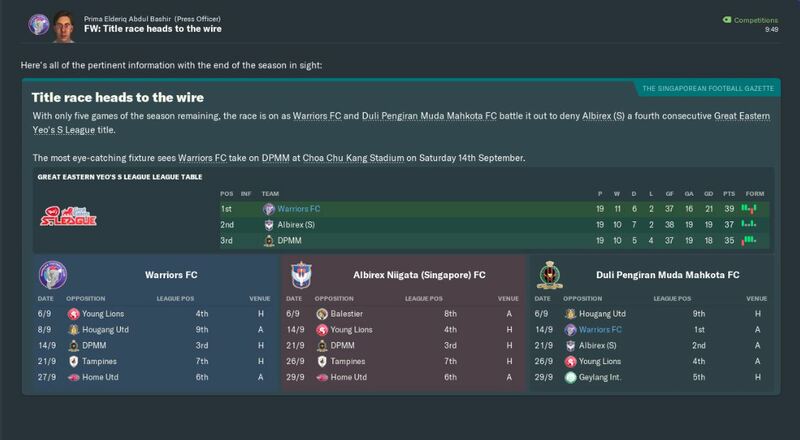 We begin our league campaign with a good 2-0 away win over Huangang. 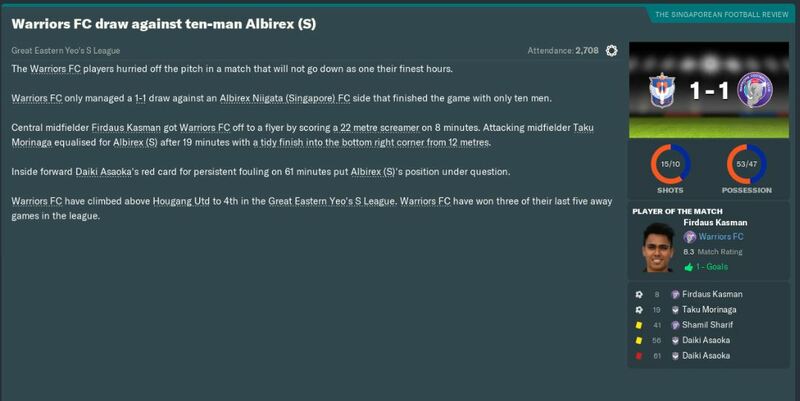 We followed that win up with a credible draw against current champions Albirex. Which was followed up with another draw, this time a 0-0 with Geylang. 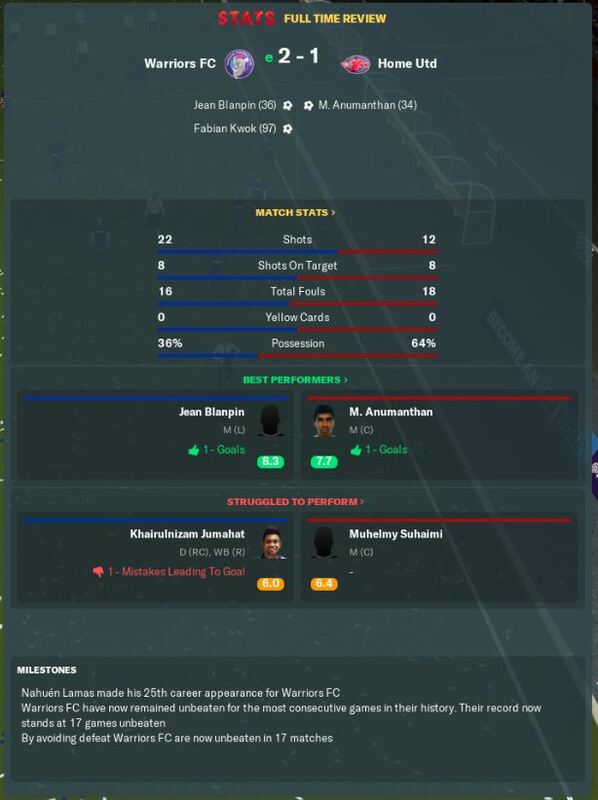 We absolutely dominated this game and Geylang were very lucky to get a draw here. 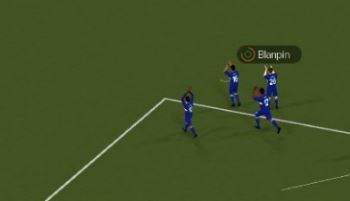 Next 2 games of our first month of league games sees us record back to back wins over Balesiter 3-1 and a 1-0 win over Young Lions. 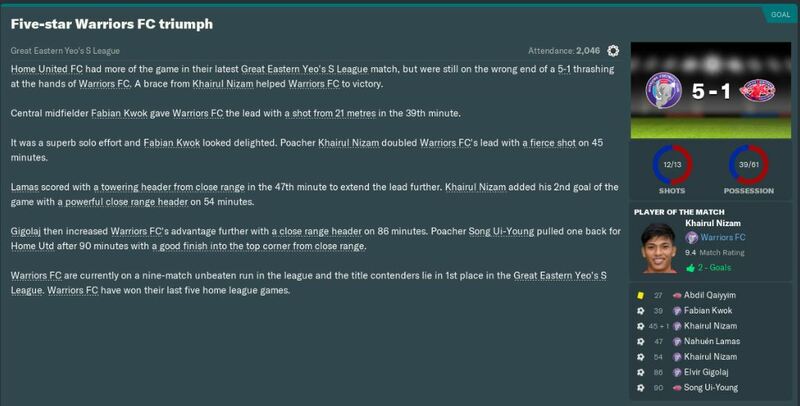 Confirmation of 5 games unbeaten now which was followed up (obviously) by our first loss of the new campaign, going down 2-1 at home to DPMM, which was especially disappointing as we took a very early lead. 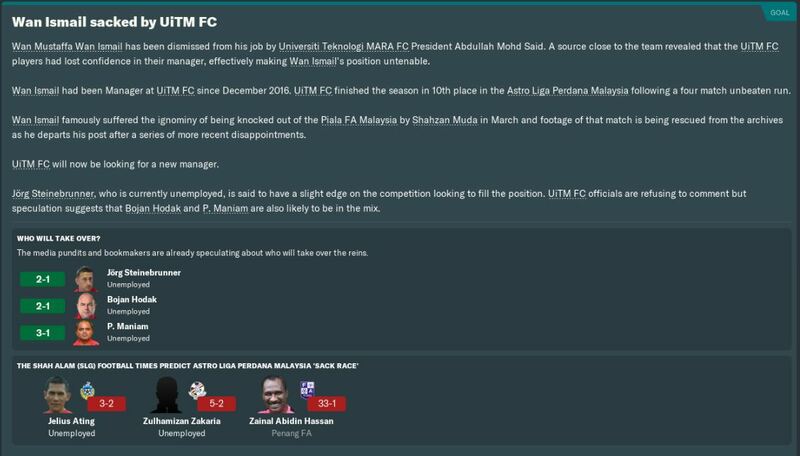 The month was rounded out with a 0-0 draw with Home United which leaves us in 2nd place after 7 games. Despite being 2nd in the league the squad are unhappy! Why I’ll never know, but I promise to increase the atmosphere, not sure how exactly. 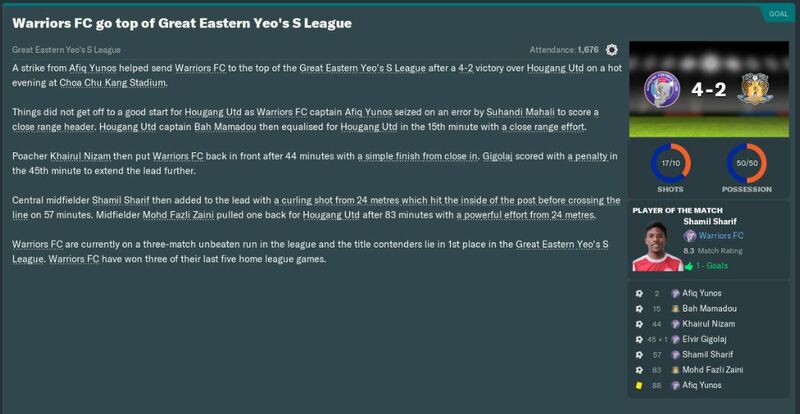 May saw us beat Tampines 3-1 and Hougang 4-2 to record big wins before another draw with ALbirex, despite them getting a very early red we just couldn’t use the extra mana to our advantage. Some good results there keeps us in 2nd place. Rounding out this update is confirmation of us being drawn against DPMM who gave us our first loss in the cup. It’s still early doors in the new season but if we keep playing like we have, a good cup run isn’t out of the question and we could end up near the top of the league. Thanks for reading, next update will be the next round of league games and anything else of note. After that we never looked back and won the remaining 4 games of the month. 3 of these was in the league cup which sees us progress as group leaders. August was a busy month for us. 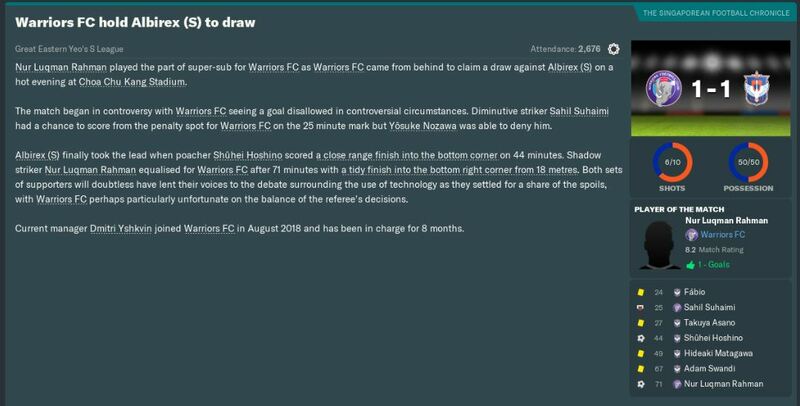 We kicked off with a 1 all draw away to Albirex before beating DPMM 1-0 in the first leg of the quarter final of the Singapore cup. 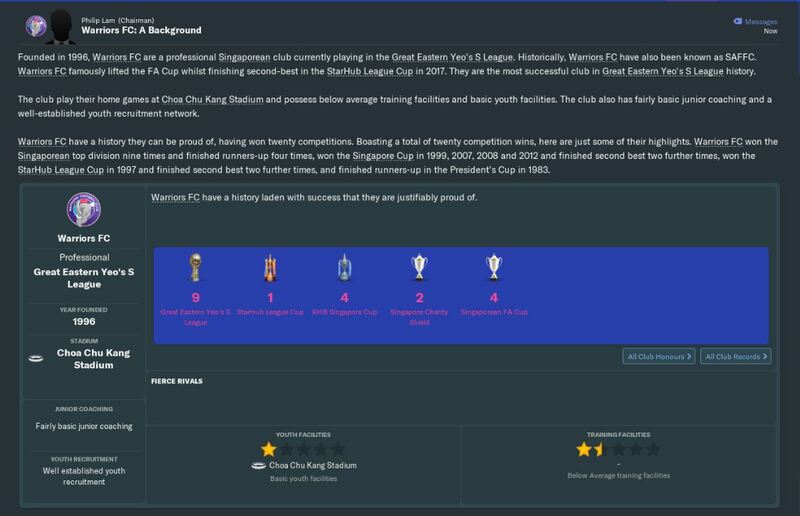 Here we are, my first cup final as a manager. A win here would do wonders for me as a manager as any success will no doubt help me in my career. 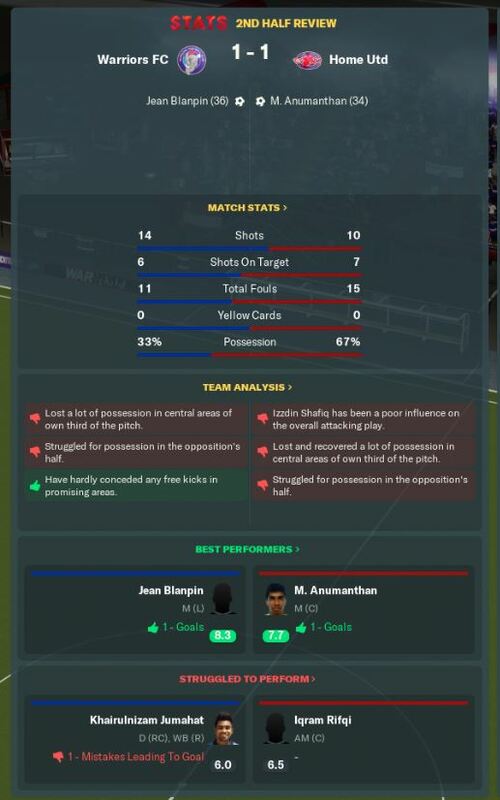 The game was your typical cup final with both teams going for it. Home United did take the lead in the 34th minute. 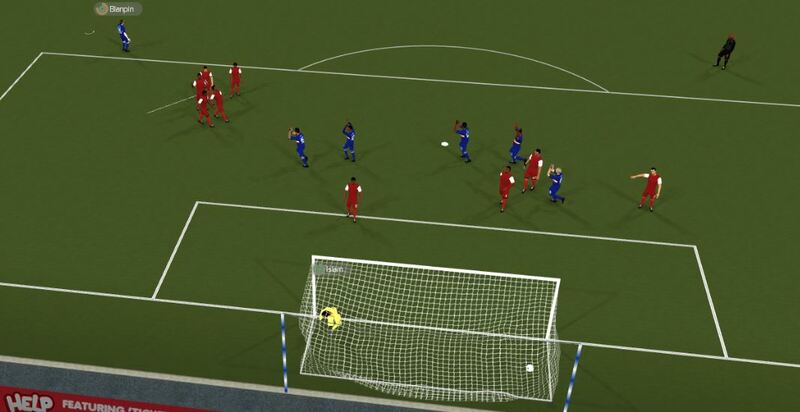 We went straight at them from the kick off and found ourselves with a free kick edge of the box in the 35th minute. Blanpin is over it. Top corner, keeper no chance, 1 nil!! Second half, despite both of us having a decent number of chances, us hitting the bar and our keeper keeping us in the game, we end 90 minutes still at 1 a piece. Extra time. 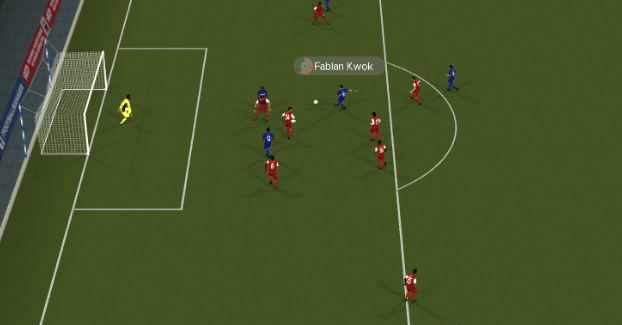 But Fabian Kwok is on hand to bury the ball home, 2-1!! We hold on for the win! My first cup win of this career and I couldn’t be happier. Hopefully this is the start of something good. 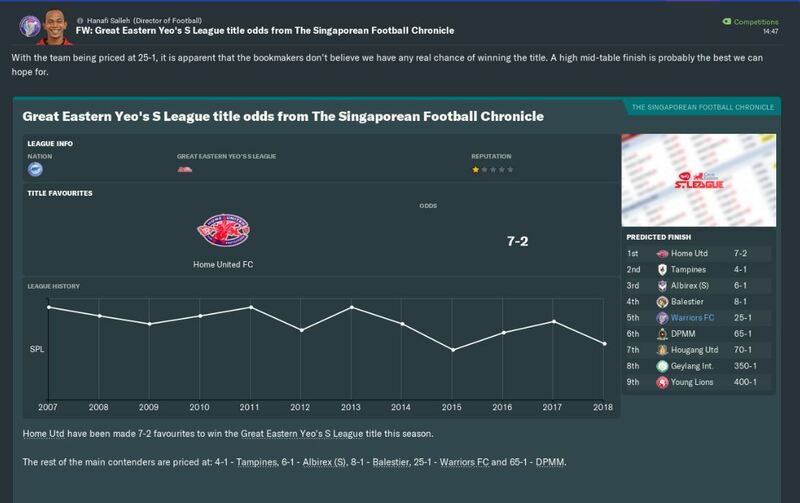 We’re still in the Singapore cup and the league title is very much up for grabs. We end the month with a win over Balesiter to record a very good month for us. We're still top and depsite that loss to Geylang we're looking good. 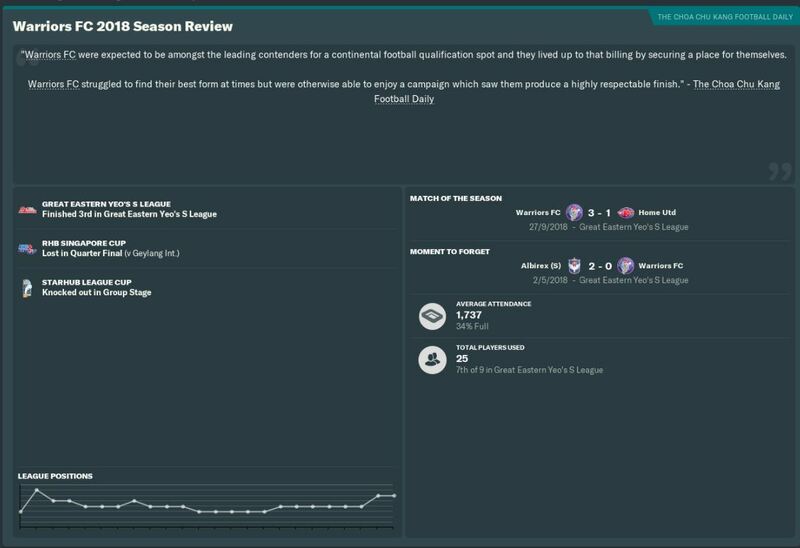 Next update will be September and the run in towards the end of the season. 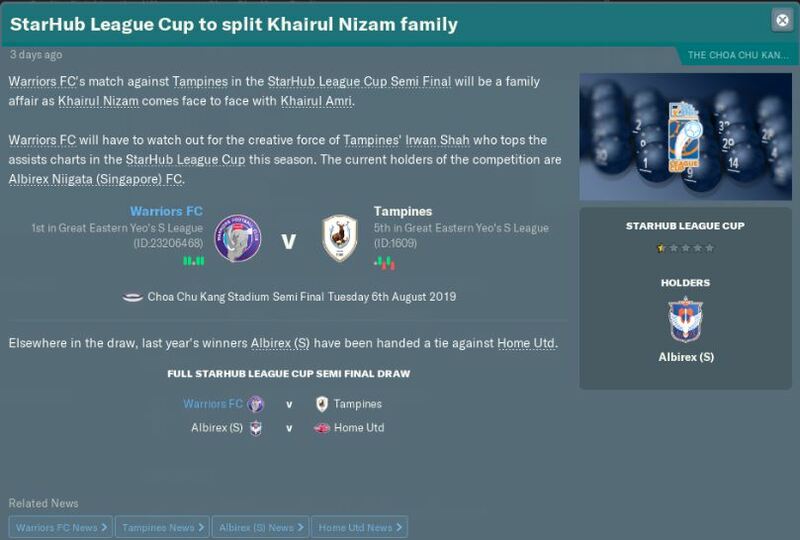 We also have the second leg of the quarter final of the Singapore cup as well which will be covered in the next update. Thanks for reading, it is appreciated. With 5 games to go, we’re in with a shout of winning the league. 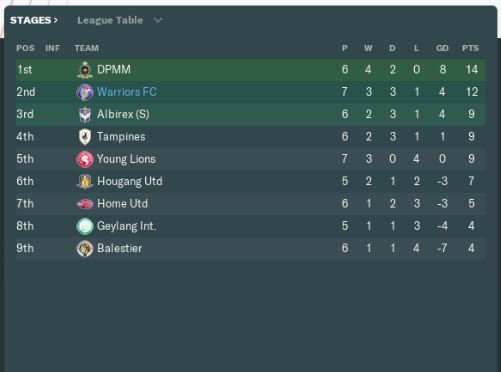 3 of our last 5 games are at home and Albirex & DPMM have to play each other, so whilst it was unlikely at the start of the season, there is a good chance we can win the league. We need some good performances as well as the other 2 teams to drop points to give us the best chance of winning the league. We start our final 5 games with a poor loss to Young Lions which will open the door for Albirex to close the gap. We were held to back to back 1 all draw with Huangang & title chasers DPMM (a last minute equaliser for us!) which meant we dropped to second with 2 to play behind Albirex, who still have a game in hand over us. 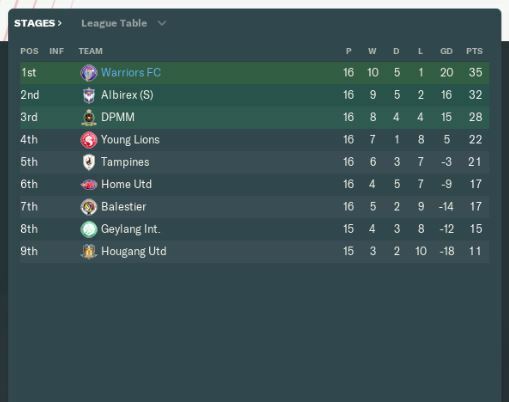 So our penultimate game is against Tampines and we need nothing but a win here to keep us within touching distance of the league. Pathetic. 1-0 flattered us. That has to be our league ambitions over now. 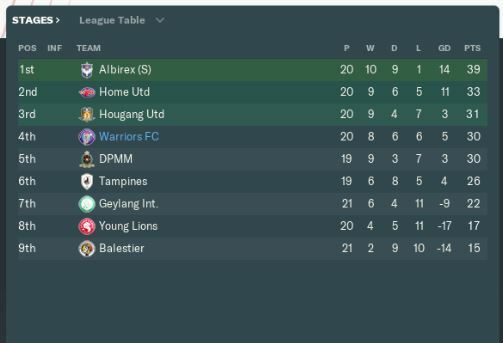 Well it’s back to cup action now and we’ve got fellow title chasers Albirex in the first leg. I tell the team we’ve nothing to lose and to play their natural game. Part of me is thinking they might field a weaker side as they’re looking at the league as a priority. WOW! If this had been in the league the title would’ve surely been ours, but we’ve definitely got 1 foot in the cup final now! Here we go then, the final day of the S League season. No matter what happens we’ll finish no lower than third, which is where we finished last season. Not only that, but as the other two teams at the top with us are ineligible for the Champions League we’re also guaranteed a spot in that competition next season too, and as the other 2 teams are heavy favourites for their games, I won’t be too disappointed if we don’t win the league. We’re up against Home United away, and we really need a win here to give us a glimmer of hope of winning the league. IF we do win and either of the other 2 teams drop points, which is unlikely, we’re in with a shout. Well maybe this season it just wasn’t meant to be. 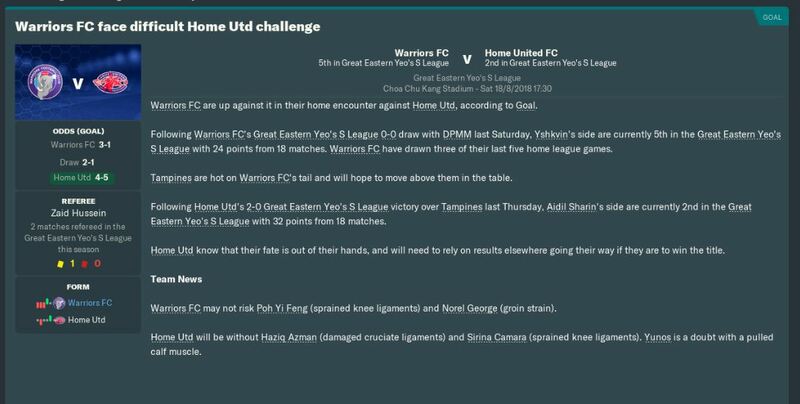 I might as well check on the other 2 games seeing as they take place 2 days after ours, how did Albirex get on against Home United? Well that is surprising. They clearly are still feeling the effects of getting battered by us in their last game. Scenes. 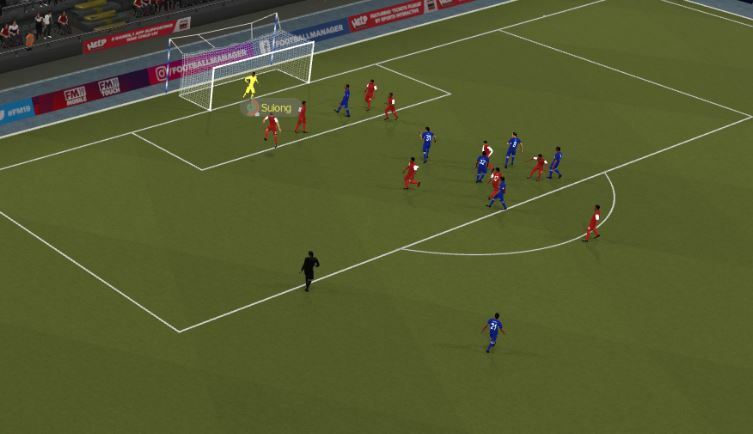 Absolute scenes! Cheers Geylang! I cannot believe this, cannot believe it at all! 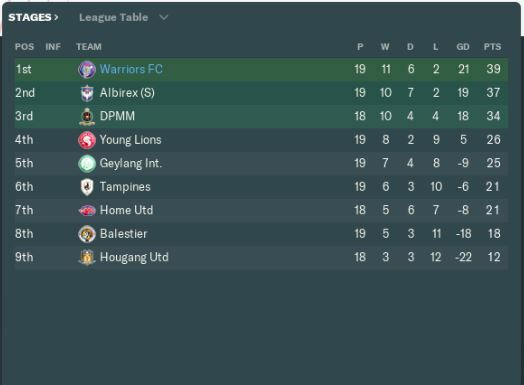 Alright we won on goal difference having scored 3 more than Albirex but a league title in my second season here is just nuts! 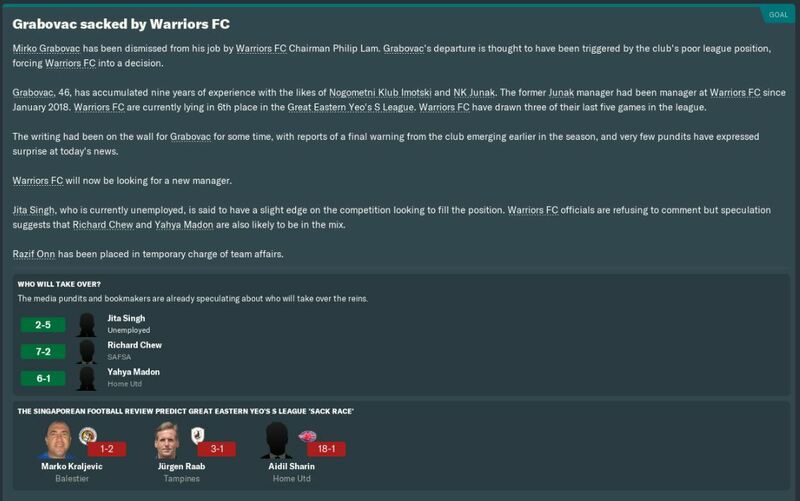 I’d be lying if I said I knew we would win the league, I thought it was all over but we managed it, somehow! Despite not winning any of our final games we still managed to win the title on goal difference. This will definitely help put me out there for future jobs along with the League Cup win from earlier in the season. Dare I say we could win a treble this season? 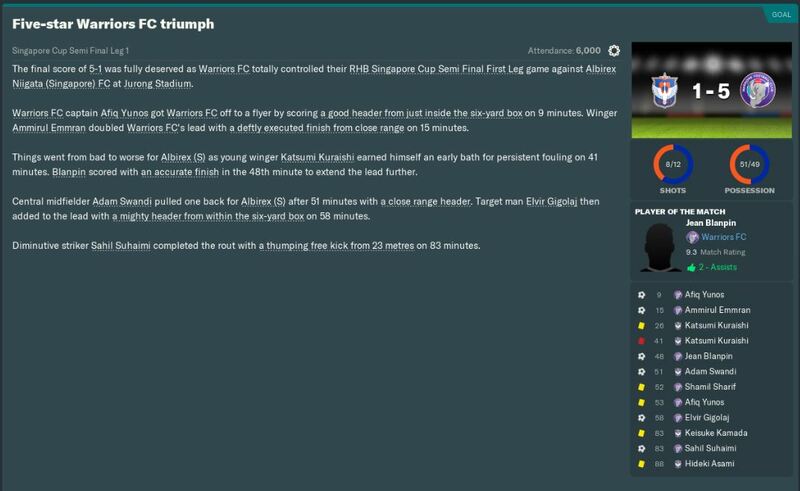 Next update will be the second leg of the semi final in the cup, if we get to the final and anything else of note. I'd appreciate a follow and any tips you might give. Next episode after will probably be on Monday. Thanks for the support. Hopefully get the next episode up today too. Hopefully new one will be up today or tomorrow. Next episode should be up either tomorrow or over the weekend. Aiming to get the next 2 episodes up no later than Monday. Cheers.